Come with us to take a quick look back at the year's biggest moments, the activities and innovations that shaped an extraordinary foundation for us, and what we're looking forward to in 2018. A year ago at this time, we said "farewell" to our monthly distribution and "hello" to our weekly distribution. We went from picking up several hundred pounds of food from Target, to several thousand pounds per month, including the addition of meats and produce. We increased our reach to single mothers, seniors and people in transition with their employment and career development. We networked with local agencies, mostly in Woodbury, to provide food and support. We began our "Good Neighbor" program, where we come alongside a local organization each month to help with resources, volunteering, or being a part of their special event. 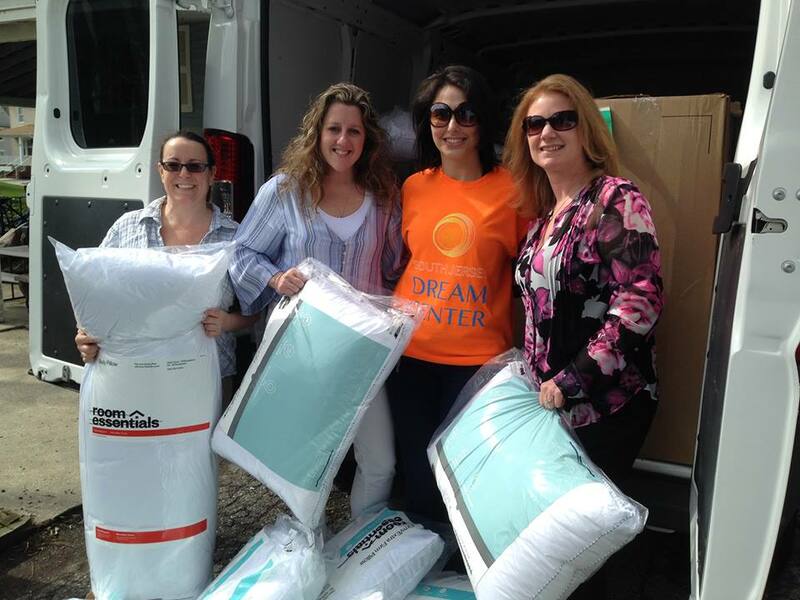 We donated pillows to Family Promise of Glassboro, food for the Rowan University Student Food Pantry, volunteered at Mothers Matter as a group, and competed in the United Way of Gloucester County annual Kick off event, to name a few. We actively pursued three different properties to serve as a permanent home to the SJDC. Each one with tremendous potential and more than adequate space to fulfill our mission. But we received a closed door, closed door, and a partially open door. If it's not the one for us, we simply move on. We won't stop until we locate and eventually purchase our own place. We welcomed new teams and new sponsors for our Sixth Annual Dodge Hunger Dodgeball Tournament, held at the RiverWinds Community Center on the first Saturday of November. Plans have already begun for Dodge Hunger 2018, which promises to be our best tournament yet, with the help of our new event planner, pro bono! In 2017, we joined Instagram and jumped to 200 followers in several months, almost doubled our Facebook page likes, and took our website to a whole 'nutha level! We worked with three Rowan University Marketing Interns, met with various consultants, nonprofit professionals, and business managers, and attended workshops and conferences. For the first time, we developed a Business Plan, Fundraising Plan, detailed Annual Budget, Case for Support Presentation, a Monthly Partnership Program, and subscribed to a web-based donor management system. We began fine tuning our operations manual and job descriptions. We also held our first Giving Tuesday campaign targeted at establishing and funding our Jobs for Life Program. Why? God is building a strong and secure foundation at the SJDC, and preparing us for the amazing things He has waiting for us in 2018, and the people we serve. Each day we take a step closer to our grand opening, our training and education programs, our outreaches, workshops, and providing an abundance of food, clothing and basic household items that give people hope for a brighter tomorrow. "Can't Wait to show my son the cereal!" "After the South Jersey Dream Center van pulled away from our building, Victoria sat across from my desk in tears", shared Wisdom Zio, the Program Manager at the Mid-Atlantic States Career and Education Center (MASCEC) in Woodbury. "She told me, 'I don't believe in angels, but there are times, I can't deny these angels are there. This morning I prayed and asked for food for my kids (six-month old and four year-old). I was worried how to get home on the bus with no food and face my children. Now, I'm excited to get home to my son and show him the cereal.'" Why was the South Jersey Dream Center delivering food to the MASCEC? Last January, we began our search for a larger facility to host our monthly food and clothing distribution. We had outgrown three locations and knew it was time to find a more permanent place, a place big enough to fulfill our mission. In the meantime, we continued to receive food from retail partners, but we were now without a place to distribute it. So, we found five local agencies that reach out to low income and struggling families, and made arrangements to deliver our food to them each week until we found a place of our own. One of those agencies is the MASCEC. The MASCEC provides career and job skill development for disadvantaged, disabled workers, unemployed, and ex-offenders who are seeking full-time permanent employment. Each week, men and women from Gloucester County who receive Social Service benefits participate in job readiness training, career path counseling and assessments, career and educational goal setting, and so much more. "The people who come to us are able-bodied individuals who have either come upon hard economic times, or have a a criminal background, or lack certain skills, or in most cases, the education necessary for a well paying job", explained Wisdom, who oversees the Work Plus and Fast Track programs at MASCEC. "We offer a way to close the gap between what they are lacking and the necessary skills they need for their chosen career path". The MASCEC provides a multitude of curriculum for participants to begin training in fields such as Medical Assistant, CDL Driver, Physical Therapy, Speech Therapist and more. "Our participants actually work from 9-4 each day. They are on time, dressed well, speak well (no profanity), and are trained to be in a professional environment", said Wisdom. "But I have to say, when the South Jersey Dream Center started making regular food deliveries on Tuesdays and Wednesdays, attendance became more regular. People started bringing carts and bags to take their food home to their families. Especially the men and women in our Dependents Program, who are highly motivated and very responsible. They are so thankful for the food to feed their children while they are doing all they can to seek full time employment". People such as Brandon, a father of three children under five years-old whose girlfriend died in a car accident. Because of his criminal record he couldn't find a job and became depressed and weary, and struggled to find food to supplement the small amount he received through food stamps. Wisdom shared that "He would sit in my office and cry about having no food and money, no matter how hard he tried to provide for his family. His baby would cry all night because they had no food. Then one day the Dream Center came with food, and specifically asked if there was anyone with an infant, because they happened to have formula that week, which was very unusual. I can't describe his joy, he was euphoric, he held tight to the formula as he talked to me. Even after he moved on from the program, because he found part time work with the city, he still came back on Wednesdays for three more weeks to pick up food". Or Lloyd, a 58 year-old single man, who has really struggled in life. As the caretaker of his 15 year-old nephew, food was a real issue. Lunch at school was the only consistent meal for his nephew, unlike breakfast or dinner which many times just didn't happen. The first day he visited the MASCEC, it was a Wednesday and he received food. He was shocked and delighted. As a former cook in Atlantic City for many years, he worked wonders with the meat, and potatoes and beans that he received each week. Wisdom concluded this story with "Even though he has a job now, I still pack a small box for him and he stops by after work". Over Thanksgiving, we provided 15 food baskets complete with turkeys. Again, for many of the participants, they had no idea what they were going to do on Thanksgiving Day for food. That all changed when they showed up at the MASCEC the day before the biggest "food day" of the year and received their baskets! Even for everyday meals, the Dream Center makes life a whole lot easier by helping out with meat, bread, produce, canned items and some specialty items here and there. Cereal is still the favorite, and a quick and easy meal, especially among the homeless participants. So, while the job search continues for the precious people at MASCEC, please know that every time the van pulls up to their building on Delaware Street and delivers food and a whole lot of love, we couldn't do it without your support and faithfulness. You are making all this possible. We are so thankful to God for you and continue to pray for Him to increase you in every way. Have you been waiting a long time for something to change in your life? Do you feel like giving up and quitting? No matter what it looks like around you, in Jesus, there is always hope for a brighter tomorrow. Your best days are ahead of you.